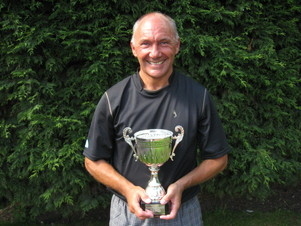 John Machin has retained his Men’s Singles title in the Rainford Tennis Club Tournament. The defending champion won his match against youngster Conor Porteus winning in three sets by the scoreline 6-4, 5-7, 10-8. Conor Porteus made up for his disappointment by winning his next match in the Boy’s Singles Final, winning 6-2, 7-6 against Sam Sheen, in front of a packed crowd on finals day at the Jubilee Recreation Ground. There was a double for Porteus who went on to win the Boy’s Doubles with Joe Machin, winning 6-2, 6-0 against Jack Chisnall and Nick Power. Krystal Connar retained her Girls Singles title against first-time finalist, Lara Kirwin, winning 6-2, 6-4. Connar and Larissa Box also won the Girls Doubles for the second year in a row. The final match of the day was the Men’s Doubles Final, which saw four members of the 'Green Army', Rainford’s promotion winning team, battling it out for the silverware. After a dramatic match, Andrew Corish and Simon Webster lifted the silverware with a 7-6, 7-6 victory over Rob Jones and Jamie McCafferty.